Description: Winter Season - Is a side project similar to Summer Season. This hack I made is just for this winter. 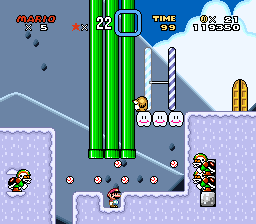 There are 7 main levels + 3 specials in this game, each level have one exit, but also some secrets. Check out Bonus list if you curious about it. UPDATE: Welcome Screen is now some kind of menu, were you can start playing game or check out "Cheat codes" room. As I said previously, get testers to play your hack without tools. As it stands, the first few levels of this hack are quite enjoyable, but the rest just a nuisance to play.